A German woman in Dusseldorf blocked the entrance to an underground station when she mistook it for a subterranean car park, police said on Wednesday. The 52-year-old drove her Volkswagen Beetle across the pavement and into the entrance, where it came to a halt five steps down. 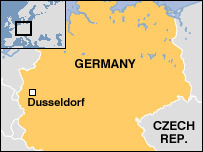 Police estimated the damage to the station at around 1,500 euros (£1,000). 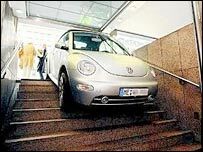 The VW Beetle-Cabrio remained balanced on the fifth step and the woman was able to get out unaided and unharmed. The accident happened in the Nordstrasse underground station, in the centre of Dusseldorf. A truck later towed the car out of the stairwell. A local newspaper said the woman was more shocked and embarrassed than hurt. A similar incident happened four years ago in the same underground station, when a 50-year-old man from Dortmund also mistook it for an underground car park. Andrea Blome, head of Traffic Management in Dusseldorf said: "We had only recently transformed the entrance to the station". She said the stairwell had been painted a brighter colour and extra lighting had been installed. But she said no further changes were planned following the latest incident, and that the station was not considered dangerous.